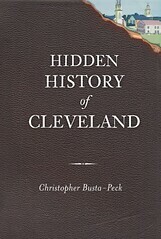 Today's guest post is courtesy of James Nickras, author of The Ohio Book Review. Hetrick, J. Thomas. Misfits! Baseball’s Worst Ever Team. Clifton, Va: Pocol Press. (1991). 100th Anniversary Edition. The 1899 Cleveland Spiders were the ultimate Cleveland sports team. The owners (the Robinson brothers) were loathed. It seemed like the league was against the team. The players were mostly sub-par -- and those players that were not, were traded away. 1899 was a watershed year in early baseball history in that the season led to the end of the National League-only system of “major” leagues, and opened a door for the American Association, which started in 1901. (These two leagues eventually were joined, and the only noticeable difference now is that the American League uses a designated hitter.) Every day of the Spider’s 1899 season is chronicled in Misfits! In case you have forgotten, I will give you a brief synopsis of the 1899 season. The Spiders were a moderately successful franchise throughout the 1890s, with numerous future Hall of Famers, including Cy Young. After the 1898 season, the Robinsons purchased the St. Louis Browns and proceeded to move the more successful Spider players to St. Louis. (Yes, they owned both teams. Brooklyn and Baltimore had the same arrangement going into the 1899 season). As the season progressed, any quality players (including the Spider’s manager Lave Cross) were traded away to St. Louis, and by the end of the season, any player on the Spiders still making money was released. Cleveland fans quickly lost interest in the team, and the Spiders (commonly referred to as the Misfits), played most of their games on the road. As could be expected, the Spiders put together a historically bad record, losing 40 of their last 41 games. To put this into perspective, let me compare the Spiders with some well knows losers: the 1962 New York Mets and the 1991 Cleveland Indians (who had the worst record of any post-WWII Cleveland team). As a redeeming note, the St. Louis team (called the Perfectos) had a disappointing 5th place finish. At the end of the season, the National League contracted 4 franchises, including the Spiders. I will compliment Hetrick on the painstaking research that went into Misfits!. Though much of the day-to-day information was obtained from the Cleveland Plain Dealer reporting, he verified much of the information from the opposing teams local newspaper and from other national publications. This led to many humorous observations on reporting styles or discrepancies. In an ongoing joke, the Plain Dealer mistakenly gave a loss to Frank Bates for the Spiders, though he did not pitch in the game. This error defined Bates in Misfits!. In fact, the cheap shots used by other newspapers to describe Bates’ performances make up some of the book's best humor. Poor Frank Bates! It should also be noted that the newspaper coverage was much more opinionated and harks back to a time before there was a school of journalism. Well worth checking out. Through following the day-to-day travails of the Spiders, several stories develop. We learn of the last major league games of Louis Sockalexis, whose name is thrown around much, though he had a very brief career in Cleveland. There were also a few above-average eccentrics on the Spiders, and the book details the daily antics of Tommy Tucker and Frederick “Crazy” Schmidt. I would recommend the Participant’s Careers appendix, which includes a brief (or not so brief) biography of every player on the team. That said, Misfits! is not for the faint of heart. Even with Hetrick’s playful humor throughout, you are still reading a day-by-day account of a team that lost almost 9 out of 10 games. How many jokes can be made about losing? Read this book and find out. In my opinion, the book's greatest asset is the detailed portrait of how the game was played in the late 19th Century, prior to the era of the World Series. Misfits! is a document of how teams traveled, their schedule (many double headers, sometimes involving three teams), fan interaction, and how the game was covered by the local news. Yes, these aspects may have been more compelling when following a winner, but the Spiders were a historic team. And historic teams are what get remembered.